Teach your students or clients how their choice of words impacts their relationships with others. Read one of the suggested books (or use a real-life conflict as a starting point), then choose from these 6 worksheets. Best for grades 2-5. 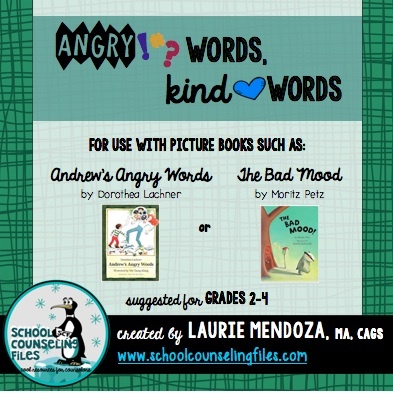 I’m a big fan of using picture books in my classroom guidance lessons, and have two favorites that illustrate how bad moods can be contagious and how our words impact those around us. The two books are ANDREW'S ANGRY WORDS by Dorothea Lachner, and THE BAD MOOD by Moritz Petz. Neither book is needed to use these worksheets—you can use any book or video that has the same message. These pages are intended for use in one or two classroom lessons or group sessions. You choose which worksheet and anchor chart fit the ability level of the group. You may be able to go a little younger or a little older, but I think they're most appropriate for grades 2-5. Please visit my website, The School Counseling Files, for for more counseling activities and resources, all of which are free.